Background: Smoking is the second major mortality risk factor globally. People with severe mental illness are two to three times more likely to smoke cigarettes than those without mental illness. This study aimed to reduce cigarette consumption by smokers with schizophrenia. A combined intervention consisting of auricular acupressure and a smoking cessation education program (AASCEP) was given, and its effects were evaluated. Methods: A quasi-experimental study was used. The experimental group received the AASCEP for eight weeks, whereas the control group did not. Outcomes were measured urine cotinine levels, psychiatric symptoms and heart rate variability (HRV) before and after the intervention and at 4 week follow-up. Results: After the intervention, there were significant between-group difference in SDNN and HF of the HRV parameters, but not urine cotinine levels, psychiatric symptoms, LF and LF/HF ratio. A significant between-group difference in SDNN of the HRV parameters was also observed at followup. Smoking quit rates at the 8th and 12th weeks were 19.2% and 13.5%, respectively, for the experimental group. The improvements were superior in the experimental group. Conclusion: This study supports the AASCEP could help people with schizophrenia to reduce cigarette consumption and improve autonomic modulation of the heart. Globally 12% of all deaths among adults were attributed to tobacco . The majority of smokers are aware that tobacco use is harmful and want to quit, but without assistance, quitting smoking is difficult because nicotine is a highly addictive substance. The smoking issue is one often neglected in psychiatric populations, by the patients themselves and even medical professionals. According to several investigations of severe mental patients, tobacco addiction in such populations is three times the general population . A smoking rate was 44.7% in people with schizophrenia  and this contributes to their higher morbidity and mortality from smoking-related illnesses . Smokers with a history of mental illness have much lower rates of successful tobacco cessation than the general population . One meta-analysis study reported that while the quit rate was 49% in the general population that of people with schizophrenia was only 9% . The other reported no evidence of benefit for the few trials of other pharmacological therapies (including nicotine replacement therapy) and psychosocial interventions in helping smokers with schizophrenia to quit or reduce smoking . Assistance to people with schizophrenia to achieve smoking cessation is clearly warranted by these statistics and so this study takes this topic as its focus. Cigarette smoking increases risks for chronic diseases such as respiratory disease, coronary heart disease, stroke, and cancer [7-9]. Especially, smokers who have severe mental illness experience high mortality rates are related to cardiovascular disease; with 50%~75% of people with schizophrenia have coronary heart disease . The risks between smoking and cardiovascular disease in people with schizophrenia have been concluded that quitting smoking can reduce 10 years cardiovascular event risk nearly 90% . In addition, autonomic nervous system function is negatively impacted by smoking . Fortunately, this damage function can recover upon reduction in cigarette consumption . Smoking cessation therefore contributes to health benefits and reduces smoking-related risks. Among smoking cessation interventions, the use of combined interventions has been demonstrated to be superior to single interventions . A combination of acupoint stimulation and education is more efficacious than either one alone [14,15]. A meta-analysis results showed multi-modality treatments, especially acupuncture combined with smoking cessation education or other interventions, can help smokers to eschew smoking during treatment, and to avoid relapse after treatment . Auricular acupressure, one kind of acupoint stimulation, is a non-invasive technique that increases endorphins, enkephalins, epinephrine, norepinephrine, serotonin, and dopamine levels in the central nervous system and plasma . As endorphins are released by acupoint stimulation, it has similar effects to nicotine replacement therapy, thereby suppressing one’s nicotine dependence or withdrawal symptoms [18,19]. Acupoint stimulation could worsen the taste of cigarettes, reduce the urge to smoke, and hinder the emergence of psychological symptoms . Studies have shown acupoint stimulation helps to quit smoking [15,20,21], especially in terms of reducing daily tobacco consumption  and lowering cotinine levels in the short-term and lowering urine cotinine . A systematic review study has confirmed acupoint stimulation increases the smoking quitting success rate and reduces daily cigarette consumption . However, it is unclear what kinds of intervention may help people with schizophrenia in particular to quit or reduce smoking . To verify the effects of acupoint stimulation on quitting smoking, a biological monitoring indicator such as cotinine provides objective evidence [15,24]. Cotinine is a useful biological indicator, whether detected in serum  or urine [25,26]. The main advantages of using the urine cotinine measure are that it is non-invasive and easily obtainable . Heart rate variability (HRV) is another potential indicator. One study has found sympathovagal balance and HRV in healthy smokers to be impaired . HRV increases after having reduced cigarette smoke exposure for three days in the general population . Although the impact of autonomic modulation on quitting success remains unknown for those people with schizophrenia who quitted, their autonomic nervous system activities have been observed to be suppressed . This pioneer study aimed to reduce cigarette consumption in smokers who were diagnosed with schizophrenia and were staying in community-based rehabilitation facilities. An intervention consisting of auricular acupressure combined with a smoking cessation education program was carried out, and then its effects on smoking cessation-related bio-physio-psychological outcomes were evaluated. Significant between-group differences in cotinine levels and HRV parameters over time were hypothesized. A quasi-experimental study with repeated measures was used. Participants were allocated to the experimental group received auricular acupressure combined with a smoking cessation education program (AASCEP) for eight weeks, or the control group received neither over an equal duration. Outcomes were measured in terms of urine cotinine levels, psychiatric symptoms and HRV parameters right before and after the intervention and at follow-up. Patients with schizophrenia recruited from 16 rehabilitation facilities in northern Taiwan. Inclusion criteria were: (1) over 20 years of age, (2) a DSM-IV diagnosis of schizophrenia, (3) treated in a rehabilitation organization, (4) not disadvantaged and possessing self-care ability and verbal expressive ability, and (5) a history of cigarette smoking for at least one year. Exclusion criteria were (1) acute psychosis and cognitive disability, (2) suicidal ideation, suicidal behavior, or suicide attempts in the past 30 days, (3) medication change during the study period, and (4) receiving other therapy (including pharmacotherapy) for smoking cessation. A minimum of 86 subjects were required to detect a medium effect size (f=0.25) at a 5% level of significance with 80% power using repeated measures . To account for estimated follow-up loss, 100 subjects overall were thought to be necessary. 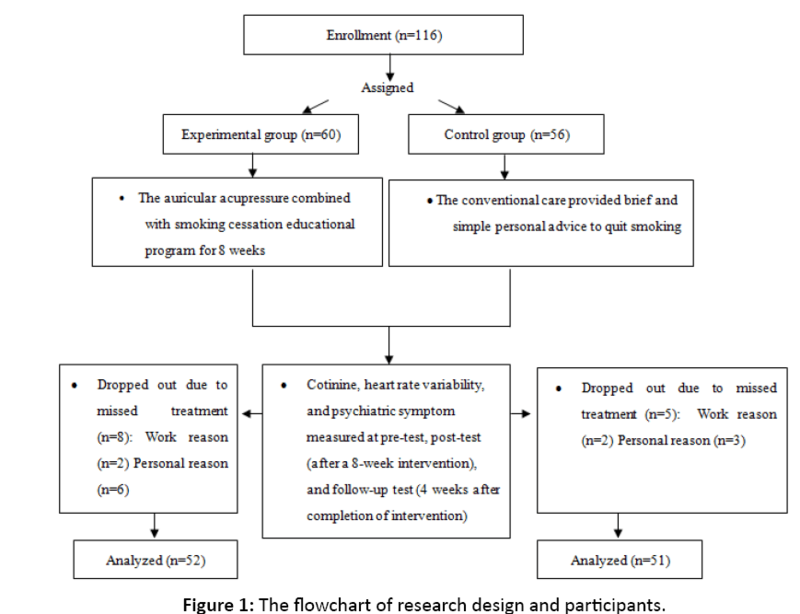 Figure 1 shows the flow chart of study design and participants of this study. This study recruited 116 participants at study onset. Thirteen withdrew due to work (n=4) or personal problems (n=9), with an attrition rate of 11.2%. The final analysis included 52 in the experimental group and 51 in the control group. All participants maintained their own medication schedule. Figure 1: The flowchart of research design and participants. Six common auricular acupoints were used for smoking cessation: shenmen, lung, stomach, mouth, sub cortex and hunger—in conjunction with embedded wang bu liu xing (cowherb) seeds . The shenmen acupoint can enhance the body's endorphin concentrations and therefore reduce nicotine dependence and slow down withdrawal symptoms; the lung, stomach, mouth and sub cortex acupoints can normalize qi energy and synchronize stomach and lung activities; and the hunger acupoint during the smoking cessation period can extend gastric motility and reduce appetite [14,24]. Two experts (a physician who practices traditional Chinese medicine, and a senior nurse who has completed auricular acupressure smoking cessation-related training and research) made sure that the intervention was performed correctly. Adhesive patches containing cowherb seeds were replaced weekly by the researcher. The researcher also ensured the participants’ compliance and accuracy in their acupressure performance when renewing the adhesive patch. All participants were instructed to apply pressure to each acupoint for one minute each time, three times a day, and additionally whenever they desired to smoke during the entire course of the study period. A structured smoking cessation education program was designed to help smokers to quit or reduce smoking. The audio content of the program was modified from a study by Chen and his colleagues, who involved four main parts recorded on CD . The major content of the educational program included: (1) understanding the tobacco hazards prevention and control act, (2) the hazardous effects of cigarette smoking to the human body, (3) ways to reduce smoking, and (4) stress adaptation. The smoking cessation education program combined with auricular acupressure was provided for 8 weeks, once per week, for 60 min each time. People with mental illness, especially schizophrenia, often suffer from cognitive or attention problems. Therefore, the structured group education portion of the program only lasted 30 min. The control group received routine care that included brief personal advice to quit smoking by nursing staff. The research process was performed by the researcher. Two senior nursing staff, who had received more than 5 years of psychiatric training acted as data collectors and assessors to collected physical and psychological data, did not know which participants were in which groups. Basic demographic questionnaire: Demographic characteristics included age, gender, education levels, marital status, body weight, body height, illness onset, smoking onset, smoking duration, daily cigarette, quitting experience, heart rate, blood pressure, antipsychotics dose and chronic illness. In addition to the demographics, physiological factors included urine cotinine levels, psychiatric symptoms, and HRV parameters were used to measure the effects of auricular acupressure combined with the smoking cessation educational program. Urinary cotinine: Urinary cotinine was a measure of nicotine intake. An enzyme-linked immunosorbent assay (ELISA, Model number 351, Thermo Labsystems Multiskan RC, US) reader was used to measure urine cotinine levels with a Calbiotech Cotinine Blood Test Direct ELISA Kit (Calbiotech, Cotinine ELISA KIT). An optimal cutoff point of 100 ng/ml was used to distinguish smoking or non-smoking status . Additionally, successfully quitting smoking was defined as urinary cotinine ≤ 100 ng/ml . Heart rate variability: Autonomic nervous system activities were analyzed with a time- and frequency-domain analytic method for R-R interval variability using the SA-3000P HRV Analyzer (Medicore Co. Ltd. Seoul, South Korea). A finger probe was affixed to the participant’s index finger to collect data over a 5 min period after the participant had sat quietly and breathed normally for a 15 min adjustment period. The SDNN index of the time domain, which corresponds to the standard deviation of all normal sinoatrial R-R intervals, was calculated and expressed in millisecond (ms). Frequency-domain using HRV power spectral analysis was calculated by the fast Fourier transform algorithm2 . HRV parameters included the lowfrequency component (LF; sympathetic modulations, 0.04-0.15 Hz), the high-frequency component (HF; vagal activity, 0.15- 0.40 Hz) and the LF/HF ratio, which reflected sympathovagal balance or sympathetic modulation . Brief psychiatric rating scale: The Brief Psychiatric Rating Scale (BPRS) was used to assess changes in psychiatric symptoms. The 18 items involve positive, general psychopathology and mood symptoms. 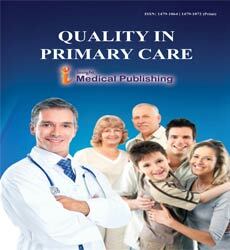 It is appropriate for patients with major psychiatric disorders, particularly those with schizophrenia symptoms . Each item is rated on a seven-point scale (1=not present to 7=extremely severe). A higher score indicates greater severity of symptoms, and the internal consistency of the Chinese version of BPRS was 0.77 in this study. Ethical approval was obtained from the Institutional Review Board of Beitou Armed Forces Hospital (No: BAFHIRB971230). Written informed consent was obtained from all participants after the study had been explained to them. Data collected remained confi dential, and all participants were free to withdraw from the study at any time during the study without affecting their treatment. Outcome measures were repeatedly obtained at the pre-test (before intervention), post-test (right after intervention, the 8th week), and follow-up (4 weeks after intervention, the 12th week) time-points. Adverse effects of the intervention were also recorded. Statistical analysis was performed using IBM SPSS version 20.0. Descriptive statistical analysis was used to examine demographic and clinical characteristics of participants. Inferential statistical analysis consisted of t-tests for continuous variables and chi-square tests for categorical variables to examine homogeneity between the two groups. A generalized estimating equation (GEE) methodology was employed to take into account outcome dependence due to repeated measurements and to explore effects of the interventions on the urine cotinine levels, psychiatric symptoms and HRV parameters. Statistical significance was accepted at p<0.05. The mean age was 45.77 ± 8.49 and 46.25 ± 7.05 years and the mean smoking duration was 25.23 ± 9.23 and 25.45 ± 9.17 years in the experimental and control groups, respectively. The majority of participants was male, single and had an education level lower than college. The average dose of antipsychotic drugs was 401.22 mg/day. Table 1 shows the homogeneity in the demographic characteristics and clinical conditions between the two groups. Table 1: Demographic and clinical characteristics for the two groups. Figure 2 presents the trends of urinary cotinine, BPRS scores and HRV parameters over time for the two groups. Further analysis found no significant between-group differences at pre-test in terms of urinary cotinine level (t=-0.60, p=0.55), SDNN (t=-0.37, p=0.72), LF (t=-1.36, p=0.18), HF (t=-1.72, p=0.09), and LF/HF (t=-0.77, p=0.45), but a difference was observed in terms of BPRS scores (t=- 2.77, p=0.01). Table 2 shows the GEE models resulted in the estimates and standard errors for a model with a correlation matrix and model-based estimates of variance. There were no significant between-group differences over time in urinary cotinine (p=0.51). The time effect was not significant at posttest (p=0.74) and follow-up (p=0.56) compared with pre-test. There were no significant trend differences due to interactions between time and group (p>0.05). After adjusting for the pretest BPRS score, the BPRS outcome showed similar results to unitary cotinine. Regarding the HRV parameters, there were no significant between-group differences over time in SDNN (p=0.70). No significant time effect was observed at post-test (p=0.05) and follow-up (p=0.11) compared with pretest. However, the trend difference was significant at post-test (p=0.01) and follow-up (p=0.01). There were no significant between-group differences over time in terms of HF (p=0.07). Its time effect was significantly different at post-test (p=0.02) but not follow-up (p=0.15) compared to pre-test. Additionally, its trend difference was significant at post-test (p=0.01) but not follow-up (p=0.11). All analyses for LF and LF/HF failed to find significant differences (p>0.05). Figure 2: Trends of the urinary cotinine, BPRS scores and HRV parameters for two groups over three time points. Table 2: The results of GEE on cotinine, BPRS, HRV parameters (N=103). The quit rates for the experimental and control groups were respectively 19.2% and 2.0% at post-test and 13.5% and 0% at follow-up. For the experimental participants, 33 (63.5%) reported the taste of cigarettes and their bodily sensations changed while smoking. Of them, 16 (63.5%) said the taste became strange and not the same as before, 11 (21.2%) reported cigarettes became bitter or spicy, 10 (19.2%) had headaches, nausea, chest tightness, or throat irritation and 10 (19.2%) felt other sensory effects. In addition, in response to inquiries regarding whether auricular acupressure assisted them in resisting cravings, 9 participants rated the intervention as very helpful, 17 as helpful, 18 as a little helpful and 8 as not helpful. The average age was about 46 years and the mean smoking duration was about 25 years in this study. These demographics are similar to those of other studies [34-36]. Daily doses for antipsychotic medications averaged 401.22 mg in this study, which is lower than the 601.1 mg value reported by another study in a Taiwan hospital . This discrepancy is attributable to differences in psychiatric symptoms and types of antipsychotic medications; Liao et al. 's patients were hospitalized, whereas outpatients were recruited in this study. After the AASCEP, this study found urinary cotinine in the experimental group was lower than in the control group at the 8th and 12th weeks, although there was no significant difference. This finding is in agreement with the study by Yeh et al. in which no significant difference in serum cotinine was observed after a 6 week acupoint stimulation intervention in healthy smokers . In contrast, Abdullah et al. ran a mobile smoking cessation program, individual counseling and 4 week nicotine replacement therapy to elderly smokers . Furthermore, using this cutoff point of 100 ng/ml urine cotinine levels to define successful quitting, this study observed respective smoking quit rates at the 8th and 12th weeks of 19.2% and 13.5% in the experimental group and 2% and 0% in the control group. These rates were lower than reported in other studies [25,34,35], but higher than reported by another study . Specifically, Abdullah and his colleagues provided a smoking cessation program for elderly smokers and observed a quit rate of 20.3% at 6 months follow-up . Baker et al. provided a smoking cessation intervention for smokers with psychotic disorders, which resulted in a quit rate of 30% at 3 months for smokers completing program. Chou et al. ran a nicotinepatch therapy for smokers with schizophrenia, and found a quit rate of 26.9% at the 8th week of the therapy and 26.9% at the 3 month follow-up. Yeh et al. provided a 6 week acupoint stimulation smoking cessation program for healthy smokers and observed a quit rate of 13%~14%. The reasons for these different quit rates may be related to age, ethnicity, diagnosis, intervention type and outcome measurements (cotinine levels versus exhaled carbon monoxide levels). Nevertheless, this study demonstrated smoking cessation is possible for people with schizophrenia. This study found no negative effects of the AASCEP on psychiatric symptoms during the intervention and follow-up periods. This finding is in agreement with studies on nicotinepatch therapy alone  or combination nicotine-patch therapies  that quitting smoking did not worsen psychiatric symptoms. In addition, this study showed that experimental group had higher HF and SDNN than control group, indicating the AASCEP increased parasympathetic nervous system activity at the end of the intervention, and that the positive SDNN outcome remained in effect four weeks after the intervention. Cigarette smoking can damage sympathovagal balance such that otherwise healthy smokers, compared with non-smokers, exhibit obviously decreased HRV and increased sympathetic nervous system activity [28,38]. Adding to these findings, for healthy smokers, Karakaya et al. found an immediate effect of cigarette smoking on increasing sympathetic nervous system activation accelerates heart rate thereby decrease HRV. Erdem et al. suggested that smoking impaired the baroregulatory function in healthy young smokers, particularly the heart rate turbulence parameters and SDNN, in part; explain the increased risk of arrhythmias and sudden death in smokers . In conclusion, the AASCEP increased HRV and parasympathetic nervous system activation in people with schizophrenia during the intervention period, and the HRV effect even persisted to follow-up. In addition, this study demonstrates the effect of auricular acupressure to alter the taste of cigarettes and the desire to smoke. This psychosomatic result is agreement with those of other studies [15,17] and may enhance success for quitting or reducing smoking. Providing intervention for smoking cessation is an essential obligation to medical staffs, especially for people with schizophrenia because smoking deeply rooted in psychiatric culture as a way of interpersonal communication. This study supports smoking reduction and cessation is not unattainable, the AASCEP effectively helps smokers with schizophrenia to quit smoking and reduces craving in community rehabilitation facilities. Practically, auricular pressure, anon-invasive remedy, is convenient and feasible to operate and it is low cost compared with other smoking cessation approaches. Medical clinicians are encouraged to apply auricular pressure to smokers with schizophrenia in rehabilitation facilities in order to reduce smoking cravings and smoking withdrawal symptoms, and even coping with smokefree environment. This study provides the initial longitudinal, community-based results on the effects of the AASCEP. Future studies need same evidence-based research in hospital-based smokers with schizophrenia. This study has several limitations. First, non-random assignment was employed, and therefore a selection bias exists. Second, the Hawthorne effect was not guarded against, and so future researchers are recommended to employ a double-blind study design. Third, generalization of these results to patients with other psychiatric diagnoses must be undertaken with extra caution because all participants had a schizophrenia diagnosis in the present study. Fourth, although participant compliance with auricular acupressure was recorded by patient self-report, the validity of these data is perhaps unreliable. This study supports the assertion the 8-week AASCEP can contribute to quitting smoking success in people with schizophrenia. The AASCEP can decrease cotinine levels, increase SDNN and HF and even SDNN improvement remains at least 4 weeks after the intervention. Therefore, the AASCEP may activate parasympathetic nervous system activity, which is beneficial to low risk of cardiovascular disease. In addition, the AASCEP had no adverse effect on participants’ psychology or psychopathology. To our best knowledge, this is the first study to evaluate the effect of a smoking cessation program in a predominantly Taiwanese population of people with schizophrenia. The outcomes of smoking cessation or reduction seem feasible for people with schizophrenia. Suggestions for future study include increasing the number of measurement points and extending the observation period in order to give participants immediate feedback to motivate them to successfully quit smoking. An expanded observation period could also strengthen the validity of the longitudinal benefits on HRV observed from the AASCEP. The authors would like to thank participants who willingly gave their time to participate in the study. This work was supported by grants Beitou Armed Forces Hospital. SLC, MLY, NFC, JRR: Conception and study design. SLC wrote the first draft of the paper. YCC, MLY, JRR edited the draft. YCC, NFC: Data analysis. All of the authors agreed to the final content. World Health Organization (WHO). Mortality attributable to tobacco. 2012. Currie SR, Nesbitt K, Wood C, Lawson A. Survey of smoking cessation services in Canadian addiction programs. J Subst Abuse Treat 2003; 24: 59-65. Âünen Adam 2017; 30: 233-242. Tsoi DT, Porwal M, Webster AC. Interventions for smoking cessation and reduction in individuals with schizophrenia. Cochrane Database Syst Rev 2013; 28: 1-4. Brody AL, Zorick T, Hubert R, Hellemann GS, Balali S, et al. Combination extended smoking cessation treatment plus home visits for smokers with schizophrenia: A randomized controlled trial. Nicotine Tob Res 2017; 19: 68-76.
de Leon J, Diaz FJ. A meta-analysis of worldwide studies demonstrates an association between schizophrenia and tobacco smoking behaviors. Schizophr Res 2005; 76: 135-157. Adabag AS, Luepker RV, Roger VL, Gersh BJ. Sudden cardiac death: epidemiology and risk factors. Nat Rev Cardiol 2010; 7: 216-225. Centers for Disease Control and Prevention. Health effects of cigarette smoking. 2017. Goldenberg I, Moss AJ, McNitt S, Zareba W, Daubert JP, et al. Cigarette smoking and the risk of supraventricular and ventricular tachyarrhythmia in high-risk cardiac patients with implantable cardioverter defibrillators. J Cardiovasc Electrophysiol 2006; 17: 931-936. Hennekens CH, Hennekens AR, Hollar D, Casey DE. Schizophrenia and increased risks of cardiovascular disease. Am Heart J 2005; 150: 1115-1121. Bobes J, Arango C, Garcia-Garcia M, Rejas J. Healthy lifestyle habits and 10 year cardiovascular risk in schizophrenia spectrum disorders: An analysis of the impact of smoking tobacco in the CLAMORS schizophrenia cohort. Schizophr Res 2010; 119: 101-109. Harte C, Meston C. Effects of smoking cessation on heart rate variability among long-term male smokers. Inter J Behav Med 2014; 21: 302-309. Munjal S, Koval T, Muhammad R, Jin Y, Demmel V, et al. Heart rate variability increases with reductions in cigarette smoke exposure after 3 days. J Cardiovasc Pharmacol Ther 2009; 14: 192-198. Wang YZ, Chen HH, Yeh ML, Lin SD. Auricular acupressure combined with multimedia instruction or alone for quitting smoking in young adults: A quasi-experimental study. Inter J Nurs Stud 2010; 47: 1089-1095. Chen HH, Yeh ML, Chao YH. Comparing effects of auricular acupressure with and without an internet-assisted program on smoking cessation and self-efficacy of adolescents. JACM 2006; 12: 147-152. Cheng HM, Chung YC, Chen HH, Chang YH, Yeh ML. Systematic review and meta-analysis of the effects of acupoint stimulation on smoking cessation. Am J Chin Med 2012; 40: 429-442. Cabioglu MT, Ergene N, Tan U. Smoking cessation after acupuncture treatment. Int J Neurosci 2017;117: 571-578. Chang CY, Chu NF, Yeh ML. Acupoint stimulation as a smoking cessation therapy. J Nurs 2006; 53: 63-68. Yeom MJ, Lee HJ, Shim IS, Park HJ. Hahm DH. Neural mechanism of acupuncture therapy for aiding in smoking cessation. Korean J Meridian Acupoint 2007; 24: 13-25. Di YM, May BH, Zhang AL, Zhou IW, Worsnop C, et al. A meta-analysis of ear-acupuncture, ear-acupressure and auriculotherapy for cigarette smoking cessation. Drug Alcohol Depend 2014; 142: 14-23. Wang Y, Liu Z, Wu Y, Zhang O, Chen M, et al. Acupuncture for smoking cessation in Hong Kong: A prospective multicenter observational study. Evid Based Complement Alternat Med2016; 16: 1-8. Yeh ML, Wang PL, Lin JG, Chung ML. The effects and measures of auricular acupressure and interactive multimedia for smoking cessation in college students. Evid Based Complement Alternat Med 2014: 14: 1-6. Guo JL, Liao JY, Chang LC, Wu HL, Huang CM. The effectiveness of an integrated multicomponent program for adolescent smoking cessation in Taiwan. Addict Behav 2014; 39: 1491-1499. Yeh ML, Chang CY, Chu NF, Chen HH. A six week acupoint stimulation intervention for quitting smoking. Am J Chin Med 2009; 37: 829-836. Abdullah AS, Lam TH, Chan SK, Leung GM, Chi I, et al. Effectiveness of a mobile smoking cessation service in reaching elderly smokers and predictors of quitting. BMC Geriatr 2008; 8: 1-9. Man CN, Fathelrahman AI, Harn GL, Lajis R, Samin AS, et al. Correlation between urinary nicotine, cotinine and self-reported smoking status urinary cotinine among educated young adults. Environ Toxicol Pharmacol2009; 28: 92-96. Hatsukami DK, Hecht SS, Hennrikus DJ, Joseph AM, Pentel PR. Biomarkers of tobacco exposure or harm: Application to clinical and epidemiological studies. 25-26 October 2001, Minneapolis Minnesota. Nicotine Tob Res 2003; 5: 387-396. Alyan O, Kacmaz F, Ozdemir O, Maden O, Topaloglu S, et al. Effects of cigarette smoking on heart rate variability and plasma N-terminal pro-B-type natriuretic peptide in healthy subjects: Is there the relationship between both markers? Ann Noninvasive Electrocardiol 2008; 13: 137-144. Fujibayashi M, Matsumoto T, Kishida I, Kimura T, Ishii C, et al. Autonomic nervous system activity and psychiatric severity in schizophrenia. Psychiatr Clin Neurosci2009; 63: 538-545. Cohen J (1988). Statistical power analysis for the behavioral sciences. 2nd ed. Academic press. United States. Acharya UR, Joseph KP, Kannathal N, Lim CM, Suri JS. Heart rate variability: A review. Med Bio Eng Comput 2006; 44: 1031-1051. Task Force of the European Society of Cardiology and the North American Society of Pacing and Electrophysiology. Heart rate variability: Standards of measurement, physiological interpretation and clinical use. Circ 1996; 93: 1043-1065. Overall JE, Gorham DR. The brief psychiatric rating scale. Psychol Rep 1962; 10: 799-812. Baker A, Richmond R, Haile M, Lewin TJ, Carr VJ, et al. A randomized controlled trial of a smoking cessation intervention among people with a psychotic disorder. Am J Psychiatr 2006; 163: 1934-1942. Chou KR, Chen R, Lee JF, Ku CH, Lu RB. The effectiveness of nicotine-patch therapy for smoking cessation in patients with schizophrenia. Int J Nurs Studies 2004; 41: 321-330. Williams JM, Ziedonis DM, Abanyie F, Steinberg ML, Foulds J, Benowitz NL. An increased nicotine and cotinine level in smokers with schizophrenia and schizoaffective disorder is not a metabolic effect. Schizophr Res 2005; 79: 323-335. Liao DL, Yang JY, Lee SM, Chen H, Tsai SJ. Smoking in chronic schizophrenic inpatients in Taiwan. Neuropsychobiology 2002; 45: 172-175. Barutcu I, Esen AM, Kaya D, Turkmen M, Karakaya O, et al. Cigarette smoking and heart rate variability: Dynamic influence of parasympathetic and sympathetic maneuvers. Ann Noninvasive Electrocardiol 2005; 10: 324-329. Karakaya O, Barutcu I, Kaya D, Esen AM, Saglam M, et al. Acute effect of cigarette smoking on heart rate variability. Angiology 2007; 58: 620-624. Erdem A, Ayhan SS, Öztürk S, Özlü MF, Alcelik A, et al. Cardiac autonomic function in healthy young smokers. Toxicol Ind Health 2015; 31: 67-72.